So I wondered how it would go with a 50/50 mush mush of pesto and cream cheese. I am gradually working my way through various flavours of Sacla sauces and Boursin cream cheese and recently most evening meals seem to have featured either one or the other. It was the night before we left on holiday and I had 1/4 jar each left of the Sacla coriander and wild garlic pestos. 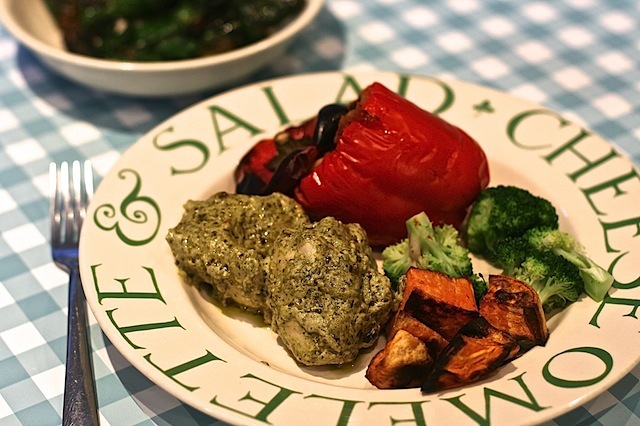 You could use any green pesto though. 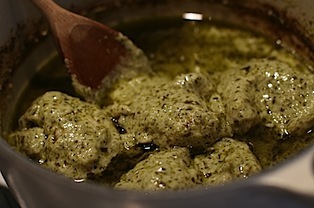 Mash the pesto into half a block of Boursin cheese until roughly smooth. The lumps melt so don’t worry too much about texture. Stir in the chicken and bake at 190c for around 30 minutes for thighs and maybe 40 minutes for breasts, depending on size. 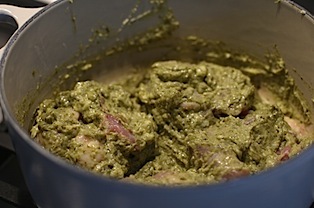 Once the chicken is cooked, the oil does separate from the pesto / cream cheese mixture but looks far more appealing than my previous experiment of curry paste and yogurt. Better still, the sauce can be reused to coat pasta – I froze mine for another day. I served ours alongside some roast sweet potato, broccoli and a left over stuffed pepper but it would go down a treat with rice. With thanks to Sacla and Boursin for sample products. Say hi to them on Twitter @SaclaUK and @Boursincheese.